When the artboard background is set to any non-transparent color - all generated assets (File>Generate>Image Asses) a filled with this color also the sizes (boudaries) of some exported layers are being calculated incorrect. 1. Ensure that File>Generate> Image Assets is turned on. 3. Select an Artboard in Layers panel. 4. Open Properties window and change artboard backgroung to Transparent. 5. Now exporting works correctly. actually, this isn't a bug at all. Your folder .png has no background color in it, so that's why generator is creating a png with the white background. Put the color fill in the asset folder and your problem is solved. Please read more carefully. It seems you did not got the problem. Please download PSD and test it yourself. And take steps to reproduce as I wrote before. Color fill layer just for demo and does not influence on anything. You can delete it. Problem is that if you set artboard background color in artboard properties PNG is not going to be generated correctly. I've performed a not deep debug and it seems that rendering order of artboard itself, not it's content is wrong and it simply overdraws generated image just before writing to disc. You say "Your folder .png has no background color in it, so that's why generator is creating a png with the white background." No it not. It creates white PNG. Not a PNG with white background (as it should). Please correct this because it leads to disinformation. Why it's updated as "Not a problem" ? It is. Please, concider revising issue once again! possibly because it's not an issue in the most current version of PS? But it is! We have 2017 latest version! And the thing is that we've tried to rollback to 2015.5 and the issue migrated there as well.. This happend on each machine we've updated to 2017. Not sure why you're only getting white square though. What OS are you using? But if you just open downloaded PSD and do not change anything do you get blue circle? Because as-is - this PSD generates white square on my system. But when i set Artboard background to transparent - the blue circle appears in png. if i open and don't change a thing, i get the blue circle on transparent. Very strange.. My guess is that the problem is somewhere in ps-to-video-driver communication. 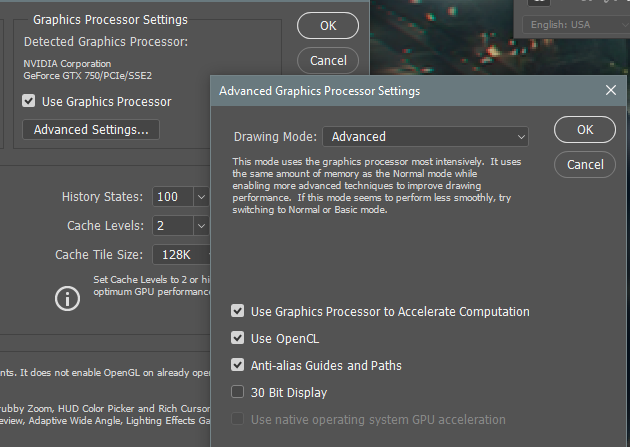 Could you please share your gfx settings?